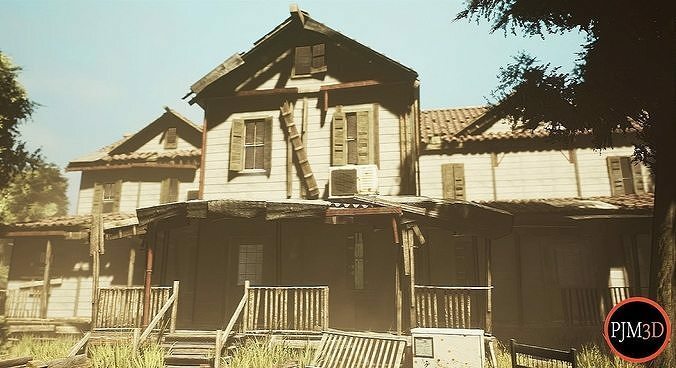 This package gives you the opportunity to build various forms of home in a certain limit, the one built in photos and videos and just an example to account for the package, you'll have to build your home as you think best for horror or zombies, but also for a desert settlement or a prairie, abandoned or in bad condition. Small furniture package and more! The possibility of building different models of houses! Hi, is it pbr ? Hello, I apologize for the time of the reply but for work reasons I delayed answering. Yes, there is PBR in some materials, I have uploaded photos with various adjustments of light on materials, and clear that the house is completely abandoned and old wood, so some materials are naturally neutral but you can set parameters in physical material with the reflection and the amount of light based on the direction in which the light is exposed. the package is constantly updated, and in the future we will also improve this aspect. Thank you! and I apologize for the bad English! Hello, With an i7 and a GTX 970 card all on Ultra only medium shadows. FPS 30-35 With Low Settings FPS 55-60 The finished house is not sold and just an example! the optimization has to do who will build a house with this package, the loads are there, the textures are not streming, but it is clear that there are so many plans to do. we sell the disassembled package with an example of a house but only a reference, in fact the demo is just a reference to demonstrate the package. The package and disassemblato you will have to build an environment that reflects your playing environment and with the necessary obsessions. Thank you! I'm sorry for the bad english! Good Morning. Many thanks for the clarifications ... I'm from Brazil, so I'm sorry for English too ... Keep up the great work!! Congratulations! No problem! For any questions are available! Great house, shack, and shed building pack! Everything is high-quality, and the sheer number of included assets make customization near endless. Also, the author has provided outstanding customer service! Would definitely recommend!